Hello Los Angeles Sprint 2015 EDesigners! This is where you’ll find all the information you need about the Sprint Studios and updates. If you have other questions or feedback, please reach out to Maggie at riddell@trueschool.org. Please bring a laptop or tablet. Dress code is business casual. Studio is a fast-paced, facilitated professional learning experience that incorporates hands-on engagement, rapid prototyping, and collaboration within and across your school team. Intersessions are periods in between Studio days for independent, team-driven R+D actions. EDesign Teams meet on their own schedules to get out into the field to engage with students, users, and stakeholders to learn about their experiences and gather their input. Feel free to read the articles below to gain context on the design process + potential for impact. Teams from 10 Catholic Schools from across Los Angeles are participating in Sprint this fall. After you park, follow the posted signs and take the elevator to the first floor. Studio will be in Meeting Rooms 6, 7, and 8. There is a security desk in the lobby with directions as well. The Cathedral of Our Lady of the Angels is located on Temple, between Grand and Hill Streets in downtown Los Angeles. 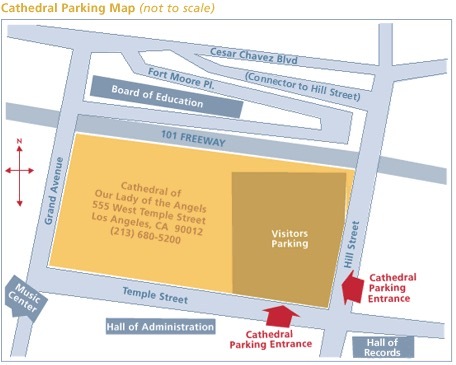 The entrance to the parking structure is located off both Temple and Hill streets. Parking will be validated. A security guard is posted at the entrance to assist in parking instructions during regular operating hours. turns– Broadway, then Temple. After crossing Hill Street, turn right from Temple Street into the parking garage. Exit at Hill Street. After you cross over the 101 Freeway, the entrance to the parking structure will be located on your right. Stay on the 110 North to downtown, approaching the 101, 5, and 10 freeway merge. Take the freeway exit marked “5 South, 1 San Bernardino–Freeway” (merge to the right). Do not take the 101 Freeway to Hollywood. You will travel on the merge lane for the 5 and 10 Fwys for about 100 yds, exit at Temple. At the end of the freeway ramp, turn left on Temple. Proceed over the Grand intersection and the Temple street parking entrance will be on your left before Hill street. Take the Hollywood 101 Freeway north to downtown. You will pass through the tunnel, proceed approximately one mile to the Grand Avenue exit. Turn right on Grand Avenue, turn left on Temple Street, and turn left into the parking garage from Temple Street. Take the 10 West, which will become Pacific Coast Highway when it reaches the beach. At the second traffic light, Beach House Way, turn left into the parking lot. Take Pacific Coast Highway south. Turn right at Beach House Way, into the parking lot. Head west towards Ocean Ave. Turn left at Ocean Ave. Turn right at Moomat Ahiko Way (afterColorado/the pier entrance) which will have signs for Pacific Coast Highway. Turn left at Beach House Way into our parking lot. Feel free to reach out to us if you have any questions, concerns, or feedback.